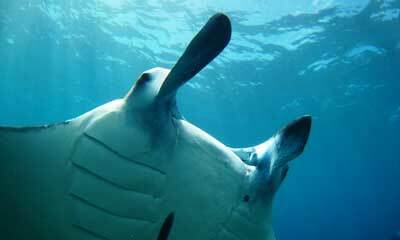 more protected than Manta Point, with the same chances of seeing these fantastic creatures. Manta bay with a stunning backdrop is rich in plankton, which attracts Manta rays year round. 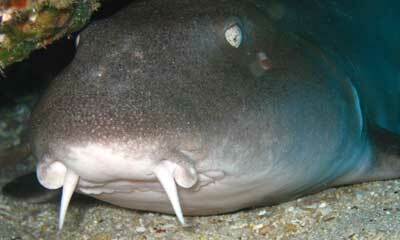 The dive site has a maximum depth of 12m and is visited by an occasional bamboo and nurse shark. 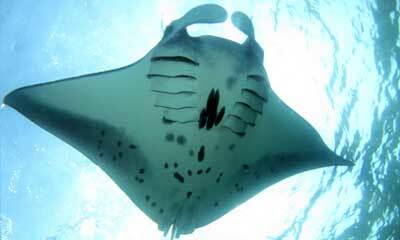 With its gullies and swim throughs, is an interesting distraction from the manta action going on above. the sun rising behind. Close to the site we pass huge stacks rising out of the water with waves crashing at their base. It is an exposed site and we need a calm day to be able to enjoy it fully. Manta Point rarely has any current at all but is subjected to the swell. The plankton rich waters here attract the mantas all year round, sometimes seven or eight at a time, though even one is a fantastic sight. The dive site plateaus to around 18m and that is where the manta action happens. Certainly mantas are the main priority but besides them, bamboo sharks and blue spotted stingrays are regularly sighted here. There are some beautiful swim-throughs where divers may enjoy the play of light and shadow. This is an exciting dive for experienced divers only. The huge expanse of current swept slopes at Blue Corner provides some dramatic topography. Here you are not inspecting the coral but watching instead for bigger fish out in the blue and the site doesn’t often disappoint. 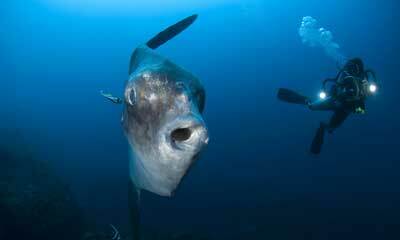 Therefore this is a great site for mola mola (ocean sunfish) during the season. 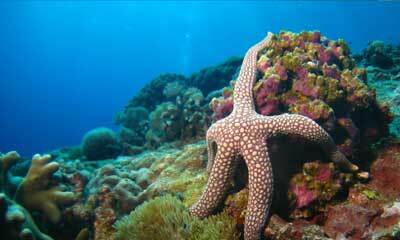 Most other visitors include eagle rays, huge marble rays, wobbegong, tuna and even the occasional shark. area’s most popular dive sites and is a favourite of the visiting mola (ocean sunfish) from July to October. 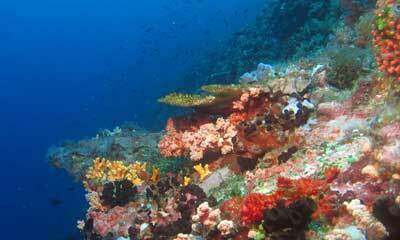 The bay floor is covered with golden sand and is surrounded by sloping coral reef to either side. A healthy reef, an interesting cave, huge table coral and hundreds of fish of all shapes and sizes – there is not much that this dive site cannot offer. reef is made even more interesting with big, randomly placed barrel sponges and coral bommies. Schools of redtooth triggerfish, fusiliers, butterflyfish and drummers compete for passing food that rides the ocean currents. Turtles, rays and banded sea snakes distract divers from the multitude of smaller creatures hiding amongst the corals, such as scorpionfish and frogfish. 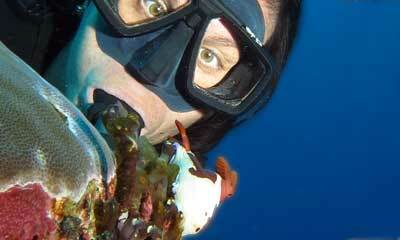 Furthermore the resident school of batfish at SD is almost always a certainty. here and once again this site is reserved for experienced divers only. The wall is colourful and fun to explore, with plenty of nudibranchs to find and sweetlips to pass if you can keep your eye off the vast depths below. often adrenaline pumping currents. Often marble rays and other larger species swim past in deeper water. Sharks are occasionally seen here too. A good site for all levels. through school after school of colourful fish of all varieties, including the red tooth triggerfish, giant trevallies and batfish. Toyapakeh is a large coral covered bay dotted with bommies that will lead you to a sloping reef that drops off gently all the way to 190m! 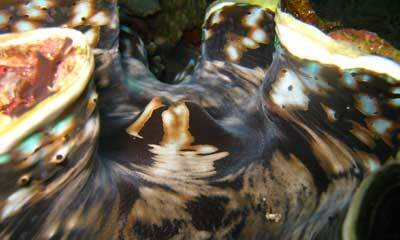 Mola sightings are possible here and even ribbon eels and frog fish are occasionally spotted by keen sighted divers. 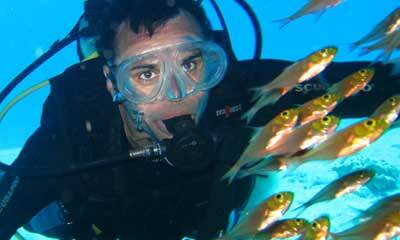 beginner divers, those wanting a refresher or for avid photographers. The sandy bottom is dotted with coral bommies which are home to frog fish, moray eels, schools of silversides, unicornfish and many more of the smaller species. This also makes it perfect for night dives.